If you are a teacher in California, the rules for collecting a California Teacher’s Retirement System (CalSTRS) pension and Social Security can be confusing and intimidating. They don’t have to be! Here’s a closer look at the rules on teacher’s retirement and Social Security. In the 1970s and 1980s, laws were passed that amended the Social Security Act in an effort to keep individuals from “double dipping” – receiving both a Social Security benefit and a pension from work where they did not pay into the Social Security system. 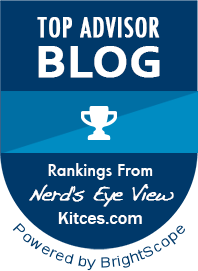 The results of these amendments are two rules that could impact your ability to claim a full Social Security benefit: The Windfall Elimination Provision (WEP) and the Government Pension Offset (GPO). These provisions reduce benefits for those who worked in a job in which they qualified for a pension and did not have to pay Social Security taxes. Since your Social Security statement does not reflect the reduction in benefits thanks to your state-run teacher’s pension, it’s hard to know what to expect if you qualify for both. The WEP rule only applies to individuals who are entitled to a Social Security benefit based on their own work history and have a pension from work where they did not pay Social Security tax. Meanwhile, the GPO rule only applies to individuals who are entitled to a Social Security benefit as a survivor or spouse and have a pension from work in which they did not pay Social Security tax. 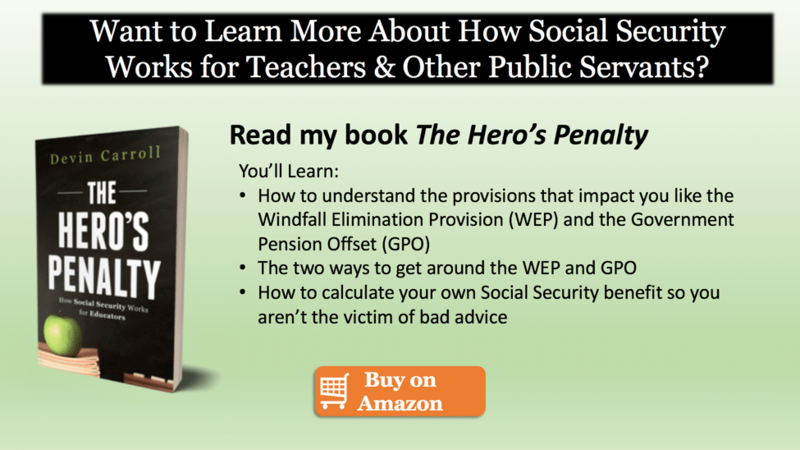 The Windfall Elimination Provision (WEP) is simply a recalculation of your Social Security benefit if you also have a pension from “non-covered” work (no Social Security taxes paid). The normal Social Security calculation formula is thrown out and substituted with a new calculation that results in a lower benefit amount. According to the Congressional Research Service, as of December 2014, about 1.6 million Social Security beneficiaries were affected by the WEP. If you have more than 20 years of substantial covered earnings (where you paid Social Security tax), the impact of the WEP begins to diminish. At 30 years of substantial covered earnings, the WEP does not apply. This phase-out of the WEP reduction offers a planning opportunity if you have worked at a job where you paid Social Security tax. For example, if you worked as an engineer for 20 years before you began teaching, you may be able to do enough part time work between now and when you retire to completely eliminate the monthly reduction. Would it be worth it? If you consider how much more in benefits you could receive over your retirement lifetime, it could be worth $100,000 in extra income over a 20-year retirement. Obviously, not everyone has the option of accumulating enough years to wipe out the big monthly WEP reduction. But for those who do, or can get close, it’s worth considering. For more information, see the Social Security Administration’s WEP Benefit Calculator and an article that I wrote covering this topic exclusively. The mechanics of the Government Pension Offset (GPO) are simple. If you meet both of requirements for the GPO – you are entitled to a Social Security benefit as a survivor or spouse and have a pension from work where you did not pay Social Security tax – your Social Security survivor or spousal benefit will be reduced by an amount equal to two-thirds of your pension. As an example, let’s say Michael worked for 30 years as a schoolteacher in California (one of the 15 states where teachers are not covered by Social Security) and his wife was a pharmacist. Upon retirement, he began receiving his California teacher’s retirement pension of $3,000 per month. His wife retired at the same time and filed for her Social Security benefits of $2,300 per month. Sadly, she passed away a short four years later. If you have never paid a penny of Social Security tax, most likely you’ll never receive a Social Security benefit. Although this makes perfect sense to some, others think it’s unfair that this isn’t true for everyone. For example, if you had chosen to stay at home as the household manager, you would not have paid into the Social Security system. However, you would be eligible for spousal and survivor benefits. Meanwhile, California teachers who never pay into Social Security won’t receive any benefits. (But of course in this case, teachers may have pension benefits that a stay-at-home spouse would not). These intricate Social Security regulations and how differently they may affect a worker’s retirement income make it critical that you plan ahead. Before you make your elections on your CalSTRS pension, you must consider how your monthly cash flow would change with a spouse’s death. As a teacher, you have plenty to keep up with and these complex rules on Social Security don’t make it any easier. But don’t let it get to you. Instead, get informed so you can make best decisions for you and your family. One way you may want to begin getting informed is by reading Calstrs Won’t Be Enough For Retirement by my friend and fellow financial planner David Waldrop. Update: Not long ago, we made a video that covers the topic of Social Security for Educators. I hope you find this helpful as well! Did your ex-spouse pay into SS? I will turn 62 this month and am a retired CA teacher. I taught for 32 years and did pay a little into Social Security, but do not get any monthly benefit from it as it would just offset my STRS pension. Am I eligible to get benefits from my ex-husband’s Social Security? He paid into PERS and is a retired firefighter. We were married 20 years and I have never remarried. I am having a difficult time getting an answer to this even after a phone call with a Social Security phone rep.